Looking for full-range loudspeakers? Have budget between 10 - 25K? If so, you are one heckuva lucky person - and not just because you have some significant discretionary audio money to spend. Though it may sound odd to the ears, the truth is that there are some terrific values in this price range. Conven-tional wisdom has it that the current king of the hill for full-range loudspeakers between 10K and 15K is the Wilson Audio Sophia. I've owned them myself. 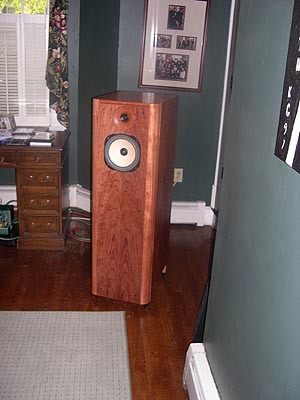 They are the most musically satisfying Wilson speaker I have heard. They work well in a wide range of rooms and with an even wider array of amplifiers. Beautifully made and relatively easy on the eyes and ears, you simply cannot go too far afield with the Sophias. The Sophia has lots of competition on the horizon, however. That includes the newly minted and very impressive DeVore Fidelity Silverback and the very promising Audiopax REF100. If your audio budget has allotted something in the neighborhood of 20K for speakers, there is even more to choose from. This includes the musically persuasive Verity Parsifal, the quite seductive Sonus Faber Amati Homage, some offerings from the fashionable Kharma line, the ubiquitous Wilson System 7 and the very distinctive Avantgarde Duos. Loudspeakers from Audio Physic, B&W and JMlab have their share of loyalists as well. Given time, we could all come up with a list of pretty impressive offerings of all shapes and sizes and for all tastes - aesthetic as well as musical. You can now add to this illustrious list the Hørning Hybrid Agathon Ultimates. 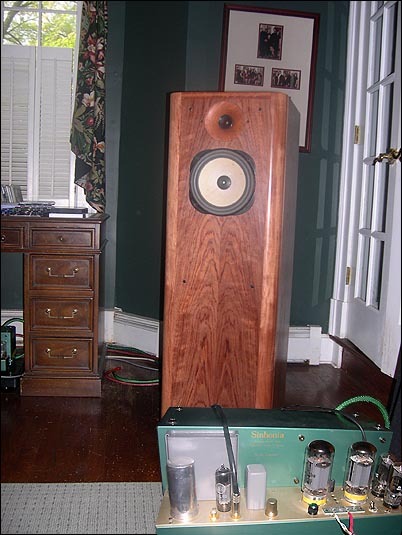 In fact, with the possible exception of the Sonus Faber Amati Homage -- which is a beautiful speaker though no reviewer's tool; its sonic character is too strong and thus inadequate for fully revealing upstream components -- the Agathon Ultimates could easily find their way to the very top of this upper echelon of outstanding speakers. speakers up; dialing them in; and then just listening to music. We were all anxious to hear what the Hørning/Shindo combination would sound like. Short answer: Magical. Longer answer: Unbelievably magical. I have been listening to high-end loudspeakers for 30 years. I've owned everything from Magnepan's Tympanis to Oris 200 horns, from Green Mountain Audio Continuums to Wilson Sophias, with many in-between stops. Who knows what the best speaker in the world is - or whether there is a best speaker. Who cares? I've been lucky. I've owned a lot of really good ones. And I can tell you this: Whatever your taste in music; whatever musical values are most urgent for you - you owe it to yourself to find a way to listen to these speakers. And that is my main reason for writing this 'sneak preview'. Summer will soon be upon us. Some of you may be shopping for speakers in the 10-25K range. Knowing what I know about this speaker, I would feel guilty if you did not know about the Hørning and were therefore unaware of a speaker that might well suit your needs perfectly. A full review should be completed by summer's end but this is a speaker you need to know about now. Before you purchase any other speaker in this price range, I want to give you a chance to figure out whether this is a speaker you should find a way to audition. The Agathon Ultimates are a three-way fully horn- loaded design with a substantially modified Lowther DX4 full-range driver employed as a midrange (no whizzer cone) and a Tommy Hørning-designed fabric dome tweeter, both of which are mounted on the front baffle. Around back are two massive rear-firing 12" Beyma woofers custom-made to Hørning's specifications by a house that specializes in woofers for professional use. These very short-throw units weigh 75 pounds each and have enormous magnets. Each driver has Tommy Hørning's stamp on it. All the drivers are loaded into rear chambers, the tweeter and midrange into one, the twin woofers into another. The internal design is a folded horn. At different points, the separate chambers feed the main horn whose mouth is at the speaker's bottom. The tweeter too sports a very heavy magnet - Tommy Hørning obviously believes in big magnets, stiff drivers and short throws. In a word, speed. The other side of speed is transparency and immediacy. More on this below. Part of the magic of the Hørning speaker derives from its way with the Lowther DX4. Used only as a midrange driver with a modified voice coil and a special treatment for the paper cone, the Lowther is finally being employed as it ought to be - from roughly 200Hz to 6kHz. What you get is all of the immediacy of the Lowther and absolutely none of its shout, peaks or phase shifts. None. I said none and I mean it. I lived with horns for years and owned several Lowthers in full-range configurations. No matter what anyone tells you, if you ask a Lowther driver to do too much (which everyone does in order to maximize the coherence of a single-driver setup), you are going to experience some of the Lowther nasties. This is true whether you back- or front-load the Lowther, whether in a Medallion II cabinet or an Oris horn. A Lowther driver wears its identity on its sleeve. In some cabinets like the Medallion II which I owned, it will occasionally shout its name at you: "I am Lowther (hear me shout)". It may only whisper its name to you in the context of some designs like the Beauhorn; and reveal its identity to you only reluctantly in others like the Rethm. But reveal its identity to you it most certainly will. Many can live happily with the peak. I could not. On the other hand, everyone who has heard a Lowther driver has experienced the magic as well. And if you've owned Lowthers, you have surely wondered what its best (non-Alnico) drivers would sound like without the peak or shout. The Agathons answer that question. The Lowther driver is one hell of a fabulous midrange driver. No driver I know has a way with voices comparable to the Lowther - and this feature of the Lowther driver survives its Hørning modifications. If anything, freed of the phase shifts a bit higher up in the frequency range, vocals are rendered with purity and body as well as immediacy. The other great thing about a Lowther driver is its midrange dynamics. So many speakers are unevenly dynamic and save their punch for the midbass. This isn't how dynamics in live music sound. Lowthers are so captivating in part because they convey midrange dynamics in a way that most drivers cannot. Again, this feature of the Lowther magic is safe and sound in the Hørnings. If you have spent any time with full-range drivers and do not suffer from denial, you know that you are missing two things: Extension at the frequency extremes and weight. Many people ignore the problems; others make peace and keep their speakers long-term. More still explore a variety of remedies, typically by adding subwoofers and super tweeters. The former makes some sense. There are a few terrific subwoofers that can match the best full-range cabinets for speed and tone. The added weight often has the additional benefit of offsetting the rough-around-the-edges quality of a full-range driver being asked to do too much. Super tweeters are another matter. I have not heard one that works well with a full-range horn though I am sure it can be done. Anything that is possible is, well, possible. But the real question is: Why bother? 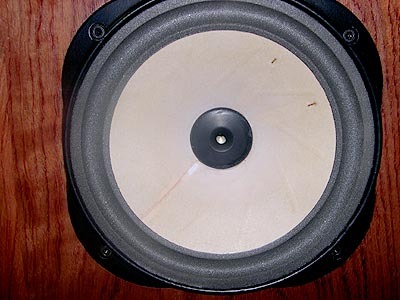 If you go the subwoofer/super tweeter route, there is a very good chance that you will have forgone the coherence that was the entire point of working with a full-range driver/cabinet in the first place. Now you've got three different kinds of drivers at work and you ain't a designer. What's worse, if you are going to add a woofer and a tweeter, you are in effect using your full-range driver as a midrange. But if that's what you had in mind, would you place it in the present cabinet where it is being asked to cover a huge bandwidth? Is this the ideal cabinet loading you would have chosen now? Not likely. After all, the cabinet you have on hand is designed to wring every last bit of frequency extension from the driver. If you knew you were going to supplement the driver with something on top and something else down below, you certainly wouldn't be asking your Lowther, AER, Reps, Phy or Fostex to strain the way your cabinet is requiring of it. Why not cut the driver off somewhere below 10 or 12KHz and put in a real tweeter doing what it's supposed to do? Why not, in other words, do just what Tommy Hørning has done? Once you hear what he has done, you'll realize that only two options make sense: Go full-range and live with the frequency shortcomings while trying to minimize the nasties in return for spellbinding immediacy and coherence; or buy one of these amazing speakers e.g. use those incredible Lowther or Lowther-like full-range drivers within a sensible range, find woofers that match them for speed, a tweeter that does so as well and build an extraordinary cabinet that can accommodate them all in unison while providing the coherence, intimacy, transparency and dynamics that horns are noted for. And that, my friends, is what the Hørning Agathon Ultimate loudspeaker does in a nutshell. Exactly how the Agathon achieves all this -- as best as I'll be able to determine -- is left for the full review along with the pertinent technical details. But let's press on because there is a good deal more you need to know about this speaker right now and today. Thanks to importer Jeff Catalano, my pair arrived partially broken in. On the other hand and from personal experience, no Lowther driver ever fully breaks in. Their break-in period exceeds the average human life span. In your lifetime, you will eventually break-in. Less happily, you will also break down one fine day. And all of that will occur long before a Lowther ever fully caves in. That said, break-in has been a nightmare with other Lowther drivers. Out of the box and just as they say, the characte-ristic sound of the Lowther is peaky, shouty and brittle. 300 - 400 hours of break-in reduces all that and replaces most of the nasties with a fair number of niceties. The nasties never fully go away; in time you just ignore them as best you can. If you can't ignore them, you move on - sometimes to a different driver, more often to a different kind of speaker design. My break-in period with the Hørning-modifed Lowther driver defied my experience. 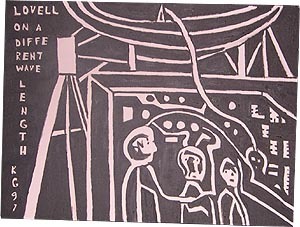 It never shouted or sounded brittle. Oddly enough, it started out a little relaxed and undynamic by Lowther standards. 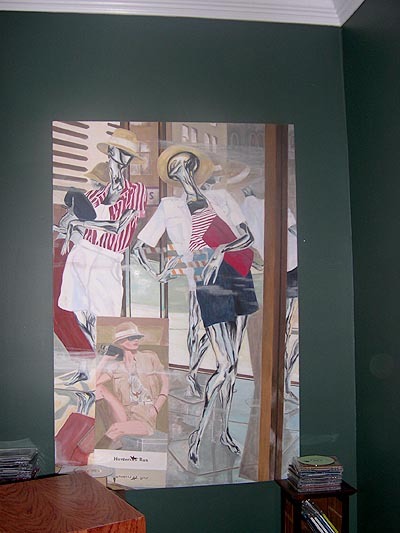 Further break-in brought it more to life and rendered the music more immediate. I cannot begin to tell you what a welcome form of Lowther break-in that was. For quite a stretch, I've been a horn guy. I owned one of the first pairs of Oris 200s in America and actually listened to the prototypes several years prior to that in the Netherlands, at Bert Doppenberg's studio (who is the designer of the Oris line of loudspeakers). At that point, he had them in a large refrigator-like cabinet with two 12" professional woofers. Bert's Oris 200 sounded great but I confessed that the look did not seem suited to residential use. And so the Oris 200 that made it stateside arrived with the ubiquitous modified Onken bass cabinet. 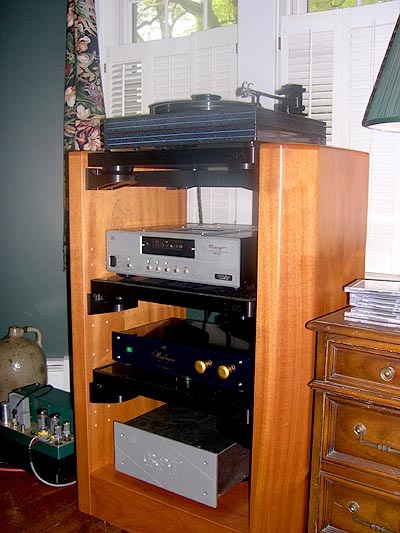 During this same period, I also owned the original Fostex 208 sigma driver in the Jericho horn enclosure; a Medallion II cabinet with a Lowther PM2A; another with an AER; and the Oris with both Lowthers and AER drivers. I even owned the little Horn Shoppe horns. I loved the Oris system especially with the better AER drivers. Still, I eventually gave up horns for one and only one reason - and not as my friends suspected because my wife (who is an artist with a fine aesthetic sensibility) complained that the horns looked like indoor satellite dishes. Which is not to say that she didn't complain (she did). But that wasn't the reason I ultimately tired of horns. The fact is that no horn ever left me alone. When you listen to music through a hornspeaker, its greatest strength is its greatest weakness. Its strength is its presence; its weakness is that it is always present. It is not the sort of speaker that takes a back seat for your listening pleasure. If you are like me, you want your music to occupy part of the backdrop of your life at certain times. Part of what makes it possible for horns to be dynamic at low volumes is part of what makes it difficult to have them around the house full-time. They can't shut themselves off. Not so the Hørnings. 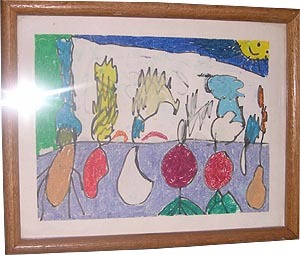 They are the first hornspeakers I have heard that can not only relax but actually recede into the background. They can fill your room with music and leave you alone to enjoy it as you please, with whatever degree of attentiveness to the music seems appropriate at the time. And more: The Agathons are the first loudspeaker in my large listening room to overcome its natural damping effects and produce substantial bass. Not even the mighty Sophia could do that on a consistent basis. And I mean real bass: Ron Carter bass; HipHop bass; Alphonso Johnson bass. Real bass like low organ notes. The Reimyo CD player is the first of its kind to reproduce an enormous amount of high-frequency musical information and energy that is not marred by a lot of digital artifacts. I have come to enjoy listening to high-frequency information on the silver disk through it. I can't fess up to enjoy listening to the same information through the majority of tweeters on the market, however. The best tweeters are the ones you are not aware of. I know people who love the new Beryllium tweeters that are becoming the rage. But every time I have heard them, I have, well, heard them. I don't know about you, but I have always wondered how good the Wilson Watt/Puppy combination might be without the inverted dome Titanium tweeter. The best tweeter I have not heard recently is the one John DeVore has fashioned for his Silverback. Apparently flat to 40K, it is extended (obviously) but very smooth. The new Hørning tweeter may well match it for smoothness and surpass it for speed. It's that good. What makes the Hørning truly exciting is that all of its component elements come together in a speaker that delivers music in one voice. And is the voice of music: Natural, warm, authoritative, alive yet relaxed. It swings and sways with the music. I you let it, it will carry you along. 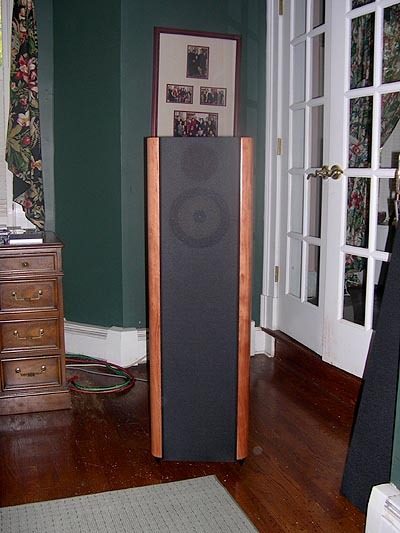 The Agathon, like its big brother the Alkibiades, is as coherent a loudspeaker as you can get with three drivers. That's in part because it has only one (and minimalist) crossover between midrange and tweeter. It has the immediacy, dynamics and vividness of the best horn designs. It almost completely disappears as a source. It exhibits no horn coloration. To be honest with you, it exhibits about as much horn honk as a Quad does - none in other words. The Agathon does not merely fill my large space, it loads and charges it. You can play the Hørnings loud without distortion and I have. There was a time on the Sunday that Jeff, Jonathan and Miles were at my place when we were all standing about ten feet away from the speakers listening to the incredible Chet Baker LP You Can Never Go Home Again and to the mind-boggling rendition of "Love for Sale" when, with Ron Carter and Alphonso Johnson playing off one another at breakneck speed, Jonathan turned to me and said, "Do you have any idea how loud we are playing this?" I had no idea but I am sure it was loud enough for Pete Townsend to make out. On the other hand and even better perhaps, you can play the Agathons at lower volumes and they will retain all of their musical virtues, including especially their ability to present dynamic contrasts both micro and macro. At the end of the day, after all the listening notes are written and the details of its bass, midrange and treble performance have been mastered, what matters about this speaker is that it produces goose bumps - even with CD! And it does all this in a reasonable and room- friendly package measuring 45" x 14" x 18". I have them sitting on Poly Crystal spikes that Jeff provided. The speakers weigh in at roughly 125 pounds each. They require some rear wall reinforcement but not much. I have them almost 30 inches off the back wall, exactly as far as the Sophias. I have them placed near corners but not in the corners. They are remarkably easy to set up and dial in. There is a large plug at the rear bottom that helps to make bass adjustments. Close the plug and bass is tight as though driven by a Spectral amp. Open the plug a bit to increase ambience and weight. The plug controls the character of the bass and contributes to the way the speaker presents itself. It has no impact on actual bass extension. As the speaker settles in more, I find myself toying with the plug a bit to dial in the sound. I have settled on opening the plug about 1 to 1.5 inches. I am sure I will make further adjustments over time. The standard Agathon has one rear-firing woofer, standard internal wiring and is fitted with a modified Lowther DX3 instead of the DX4 in the Ultimate version. The Agathon Ultimates are the top of the Agathon line. My review pair came in a stunningly beautiful special Bubinga veneer. Standard price for the Agathon Ultimates is 15K. Special finishes add $500. The Ultimates are internally wired with Audio Note Kondo copper and equipped with two Hørning-specified Beyma 12" woofers, the same driver compliment as in Hørning's state-of-the-art Alkibiades. The main difference between the two is that the Alkibiades substantially increases the internal volume of the folded horn. 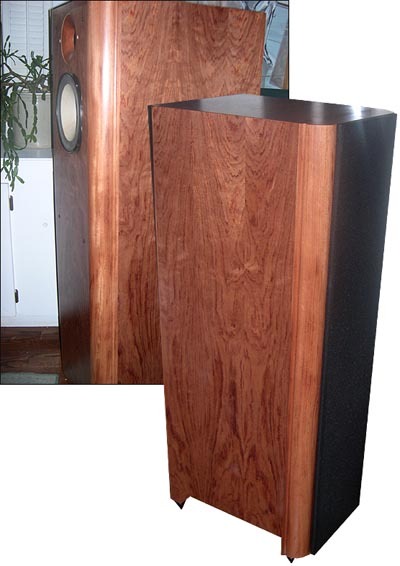 The bass drivers attach significantly higher on the cabinet and are even less likely to interact with the floor. On the other hand, the Alkibiades is considerably less room-friendly, coming in at a touch under 7 feet tall and busting the scales at 200 lbs each. Two final thoughts - for now. These are 98dB horn-loaded loudspeakers. The manufacturer recommends amplifiers from 5-100 watts. I have heard the Alkibiades sound great with as little as 7 watts. Of course this wasn't just any 7 watts but the mighty Kondo Ongaku Neiro. I have mated the Agathons with the equally impressive 40w Shindo Sinhonia push-pull amplifiers built around the F2a output tube. The Agathons love the Sinhonias' 40 watts, and the Sinhonias love the Agathons' undemanding load. Nothing makes a 40-watt amplifier happier than to play in relaxed mode without strain. In general, I prefer great push/pull amplifiers -- of which there are very few -- to most single-ended amplifiers. I fully understand and appreciate the immediacy that is the special province of single-ended designs. However, you can achieve much of that magic and have dynamic headroom to spare in a 25-50 watt p/p amplifier of the right sort. Music just comes through more relaxed in this way. What could be better than authoritative and dynamic music presented effortlessly? Personally, I don't know a speaker that really loves 3 watts but we all have different listening priorities. So just pick an amp that suits your room and your listening tastes. The Agathon obviously loves tubes but will work extremely well with excellent Class A solid state amps of modest power. Finally, these Hørning designs are the most transparent-to-the-source line of loudspeakers I have heard. You figure out what you tonally like in preamplifiers and amplifiers; this speaker will let you hear just that and nothing more. If you get the impression that I am impressed, you're correct. I bought the bigger Alkibiades. All that remains is to explain to my wife that 7-foot tall, 200-pound giant speakers are, how shall I put it, room-friendly. And to be honest, every once in a while, I call up Jeff Catalano and ask "Are you sure I really need the Alkibiades? Aren't the Agathons just perfect for my room?" It has gotten to the point where I think Jeff is contemplating an auto-response to my emails: "Jules, I promise you; you are going to love the Alkibiades even more." No speaker is perfect for everybody. But the Agathon Ultimate is a speaker you must listen to if for no other reason than to hear what's possible in modern hornspeaker design. More than that - listen to it with the best electronics around and learn what just has become possible in music reproduction per se. On behalf of Hørning Hybrid Systems and High Water Sound, I would like to thank 6moons and especially Jules Coleman for what I deem to be an accurate and insightful 'sneak preview' into the magical musical world of the Hørning Hybrid Agathon Ultimates. When I first encountered Mr. Hørning, I had been searching the world for a loudspeaker that was full- range yet able to communicate music with minimal muscle. The journey became a personal quest. Never did I have the intention to become an importer or distributor. In my travels, I met many wonderful people and I am sure they all have something special to offer. Tommy Hørning just seemed that extra bit special. Well, one year and thousands of incredible listening hours later, I am still in awe with each drop of the needle or shuttle of the evil silver disk. I am grateful and appreciative of Jules' kind words. His enthusiasm and emotional response is very much akin to my own and to the majority of people who have had the chance to audition any of Tommy Hørning's loudspeakers. In a response to an email from me, Mr. Hørning said " I am really surprised to see him (Jules Coleman) come to the essence of things so fluently and gracefully." I couldn't agree more. The Agathon Ultimates will be at the upcoming NY Home Entertainment Show in room 712 together with the amazing Audio Note Japan. Please come by for a listen and chat.